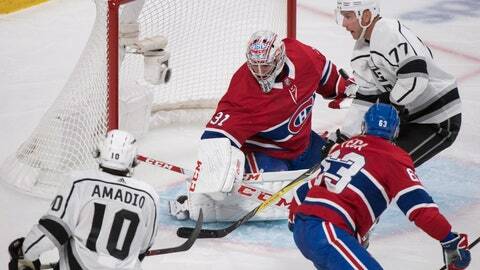 MONTREAL (AP) — Jack Campbell and the Los Angeles Kings spoiled the Montreal Canadiens‘ home opener. Campbell made 40 saves for his first career shutout and the Kings won 3-0 on Thursday night. Campbell made his eighth career NHL start, getting into action with starter Jonathan Quick day-to-day after sustaining a lower-body injury in practice Sunday. Jeff Carter had a goal and assist, and Adrian Kempe and Michael Armadio also scored. Carey Price stopped 26 shots for the Canadiens. Montreal honored the 1993 Stanley Cup-winning team in a pregame ceremony. Several players were in attendance, such as Vincent Damphousse, Guy Carbonneau and Patrice Brisebois. General manager Serge Savard and coach Jacques Demers got the loudest ovations. The ’93 Habs — the last Canadian team to win the Stanley Cup — beat Wayne Gretzky and the Kings in five games in the final. After furious pressure by the Canadiens to start the game, Kempe scored against the run of play on L.A.’s first shot. The 22-year-old first-round draft pick opted to shoot on a 2-on-1, beating Price blocker side at 3:36. Armadio made it 2-0 at 11:31 on a one-timer from the slot. The goal was set up behind the net by Jaret Anderson-Dolan, who recorded his first NHL point. Carter scored at 9:04 of the third period on a no-look slapper. It looked as though Andrew Shaw had spoiled Campbell’s shutout bid midway through the third, but the Kings challenged the goal and it was overturned for goaltender interference. Notes: Montreal defenseman Shea Weber skated Thursday for the first time since undergoing knee surgery this summer. He’s not expected to return before December. … Alec Martinez played his 500th NHL game, all with the Kings. Kings: At Ottawa on Saturday night. Canadiens: Host Pittsburgh on Saturday night.